"Father, I pray for you every day." Whenever somebody tells me that, I feel so relieved and comforted. Being a pastor brings with it tons of responsibilities. Traditionally, those responsibilities can be divided into three categories: Teaching, Sanctifying, and Governing. Under each of those three categories comes a million other things. Sometimes in my life, one area or another demands more of my attention than the others. And sometimes, if your eye is on one thing, people become upset that your eye isn't on the other thing. What do I mean? I've had the experience of needing to focus say on finances at one time or another. If you do that, somebody will say, "He only thinks about money." At other times, I've had to focus on the Catholic School. Somebody will say, "He never thinks about the children in Religious Education." If you focus on prayer, then somebody will say, "He never focuses on social justice issues." If you focus on the youth, then it can be said that you don't focus on the elderly. If you focus on spiritual things, it might be said that you are not focused on the administration of the parish. If you focus on those who have left the Church, you can be accused of abandoning the people who are here every week. The list can go on and on. Ideally, a pastor needs to balance all of these things and I've been fortunate in my life that almost everybody cuts me a break! Actually, I really am very blessed because I have found people to be overwhelmingly supportive and even more than that, I have found them to be obedient. Yes, I know that obedient is not a popular word. But, I have found in large part, people have truly been obedient to me. I don't mean in some sort of fear mongering way. I mean that they've trusted me as their pastor and have followed. When I've encouraged them to frequent confession, attend adoration, give to the poor, increase the offertory, deepen their prayer life etc, they've followed. Sometimes, I'm sure that their personal interests may have wanted to go in another direction, but they chose obedience instead. And, this obedience has produced in our life something truly beautiful. We move together in communion of mind and heart. I have discovered in my people a great sense of communion. Sometimes when I look around at my parishes, I am amazed at all that is taking place in this one small part of the Archdiocese. In my congregation on a given Sunday are people who are dying, lost loved ones, pregnant, going through a divorce, unemployed, have a child who is in trouble, or a spouse who is suffering from addiction. There are wealthy people and poor people. There are people who go to confession weekly and people who haven't gone in years. There are people who love the Church and people who are bitter towards the Church. There are a million pastoral problems, a million administrative issues, and a million things that we need to do better. But, they can't all be fixed or addressed at once. And for the most part, people are patient with that. All of that takes place in my two parishes. So, I wonder how it must be to be the bishop of a whole Archdiocese? Imagine the amount of things that must be on his mind. I think it is easy for the rest of us to forget how many things must weigh upon him. Everybody thinks that their priority ought to be his priority. The bishop should focus on good catechesis, get a pastoral plan together, fix the finances of the archdiocese, correct wayward priests, spend more time with the seminarians, spend more time with this ethnic group, visit sick priests, spend more time in parishes, do more fundraising, focus more on the poor, speak out on controversial issues, know his priests better, be more involved in supporting vocations, crack down on dissent in Catholic schools, be more focussed on administration . . . . And, everyone of those things is true. That's what a bishop should do--and a thousand other things as well! A bishop is a pastor with a very big flock and a very long list of duties. I'm very grateful that in the midst of all of my pastoral responsibilities I have people who say, "Father, I pray for you every day." Their prayers sustain me and help me to endure the rare person who thinks that his priority should be my one and only priority. How much more must a bishop with far greater pastoral responsibilities need our prayers and encouragement? I really feel the weight every day of my pastoral office. It is a weight that I am privileged to carry and is truly a joy. But, it is a weight. I am so grateful for those whose prayers and obedience help me to live out my pastoral mission. Part of the reason that they do so is because I am in front of them every day. They see me and they know me. A bishop though is not in sight every day. It could be easy to forget him or to think of him as somebody remote from our experience. The Liturgy, however, includes his name every day during Mass in order to emphasize the importance of his place in our ecclesial communion. This mention of the bishop's name in the canon of the Mass ought to remind us that the bishop and his ministry is at the heart of the local Church. It is also a moment for us to deepen our communion with the bishop and to deepen our obedience towards his pastoral authority. If you've managed to read this all the way to the end, then please make it a point to add your bishop to your prayers every day. I know as a parish priest, the assurance of prayers and the spirit of obedience makes my work so much more joyful and lighter. Let's also give those gifts to our bishop. Let's love him with our prayers and with our obedience. How Many Divisions Does the Pope Have? Since the election, I've offered Mass, signed checks, returned phone calls, given my dog his heart worm pill, and done laundry. Life doesn't seem all that different than it did a few days ago. But, it is different. America is changing drastically. Those who say that such thoughts are over the top should converse with the people with whom I converse. During the past several months, I've debated and bantered with Catholics and former Catholics who advocate for and support a radical change in the cultural landscape. These people--many of whom are my friends--didn't simply vote in particular ways because they thought that their candidate would help the poor more or would lead the country away from war. They told me why they were voting for him. They voted for abortion rights. They voted in favor of gay marriage. They voted in favor of the government compelling religious organizations to violate their consciences. They voted against the Church's position on contraception. Many of these folks attribute all of society's woes to the Catholic Church. They want the Church silenced and to move on to a society governed by secularism and want religious believers to be compelled into silence in the public square. Again, this is not my interpretation of how I think these people voted. I am conveying what they've actually told me. Some of my friends--had they been at the Democratic Convention--would have been among those who booed when they inserted the word, "God" back into the platform. In Massachusetts where I live, some are rejoicing because a ballot initiative which would have legalized Physician Assisted Suicide failed. But, I look at that too as a failure. Yes, we held the line for today. But the fact that almost half of the population of a very Catholic commonwealth could support the bill is disheartening. We are changing as a culture. For me, the election was not so much about Obamacare and Libya. It was not so much about jobs and the economy. Reasonable people can and will always disagree about the most prudent course of action when it comes to those types of issues. For me, the election was more about what kind of culture we are going to be. The election was about changing fundamental understandings about the value of human life, fundamental definitions about what marriage and family are, fundamental understandings about human dignity and religious freedoms. It was about whether religious freedom was going to be interpreted for the first time as merely the freedom to worship or whether it was going to continue to be something much bigger than that. For me the election means that the voice of the Church has been shown to be feeble and diminished. Yes, we won the assisted suicide battle this time. I'm certain that its supporters are already ready for the next round. The Church seems only capable of rallying to fight battles here and there, sometimes winning and sometimes losing. But, in the greater scheme of things, the Church is losing ground at a dramatic and alarming pace. While it is sometimes necessary for the Armed Forces to invoke a draft and radically increase its numbers to fight a particular battle, this can never replace the value of a regular army. The Church seems to have lost its ability to maintain a regular army. We have forgotten about the day to day need to win souls for Christ. If Catholics were being formed daily in the life of Faith and were growing daily in their friendship with Jesus Christ, then it would be unthinkable that legalized assisted suicide could ever get that many votes. If Catholics in Massachusetts were being formed by the Gospel, there's no way that political candidates and political parties who support abortion would not do some serious reconsidering of their positions. One thing I admire about my friends who advocate for a radical secularism in society (this is how they would describe it) is that they have a vision of society and they really pull out all of the stops to advance that vision. Sadly, the Catholic Church does not do the same thing. The greatest threat to the advancing of the Catholic vision in society is not society but is the weakness of the Church herself. There are those who teach in her institutions, who write in her publications, who work in her various organizations, and who stand in her pulpits who do not not advance the Catholic vision but who weaken us by adopting the secularist language and model. I'm sure some do this with the intention of working against the Church. But I suspect that most do it because they simply and naively adopt the prevailing language and culture. Either way, we have met the enemy and the enemy is us. Pope Benedict XVI's Year of Faith and the renewed emphasis on the New Evangelization is my source of hope and encouragement. For so long, the Catholic Church--at least where I live--has become anesthetized by the culture. It often feels as though we are pathetic wimps who have nothing serious to offer. But the New Evangelization is an opportunity to once again announce the Gospel in all of its radiant beauty and power. We are the Bride of Christ and our Bridegroom poured out his blood for us on the Cross. We can know Jesus Christ and experience the power of His love in our lives. The Catholic vision of the human person, for human life, for the value and dignity of the weak, of marriage, and of civilization is truly beautiful and convincing. We should be proclaiming it boldly from the rooftops. When people hear the Gospel, they are often attracted to it. When the Church simply adapts itself to the predominant culture, she becomes more and more obsolete. If we adopt a more intense and evangelical approach to our life as the Church, we might be abandoned by the millionaires. Often, it seems, that the wealthy donors tend to give towards those ecclesial institutions that are less faithful to the Church's mission. That's okay. Jesus didn't start his Church with the wealthy. He started with a friendship. The Year of Faith and the New Evangelization take as their starting point not any one particular moral issue and certainly not money. They begin from an encounter with Jesus Christ. We need to begin from this friendship and remain loyal to this friendship. It sometimes seems like we are trying to prove ourselves to the culture by watering down our Christian witness. We've done that for several decades. The inaction and silence of the Church on the issue of Catholic politcians supporting abortion has led us to where we are today. For decades, those politicians basically said, "The Bishops have their view and I have mine." Now, whenever the bishops speak on any moral issue, the general Catholic population says, "Well, the bishops have their view and I have mine." Seriously, whoever designed the strategy for the Church in the United States' engagement on public policy matters has done an enormous disservice to the Church and to society. We actually have something to say to the culture and something to add to the culture. Jesus said that we are the salt of the earth. We should start acting like we believe that. The culture is collapsing in on itself. Pope Benedict XVI is a general who is worth his salt. I'm going to follow his lead. During Holy Week of this past year, I received a phone call just as I was about to offer our evening Mass. A little baby was born at the hospital and was in serious danger. I offered Mass as reverently and as quickly as I could and then raced to the hospital. The mother still in surgery, I gathered with the baby's Dad, some other family members, and several nurses. Everyone was crying as I baptized and confirmed Matthew John. Today--at long last--we supplied the ceremonies that were missed that night at the hospital. Matthew received his candle and his baptismal robe at the 10:30 Mass this morning. Parishioners who have been praying for him all along were filled with joy as they met for the first time this young family for whom they have long been praying. (Although Matthew's family is here every week, not everybody would know them.) Baby Matthew's Great, great uncle was there too. He is a Jesuit priest who is 94 years old. After the Mass, Matthew's Dad told me once again how much the parish is a family to his family. And, of course, that is music to my ears. It was a joy-filled morning. Immediately after Mass, the deacon, Fr. Chateau (the priest with whom I live), and I went to our cemetery and had a prayer service. We prayed, sang, and then blessed hundreds of graves in the cemetery. There were many parishioners who joined us and who were very grateful for the opportunity to pray for their loved ones. As I walked about blessing graves, I was struck by how many of them I knew and how many of them I had buried. Then, Fr. Chateau and I went to the party for Matthew John. I am very grateful for the opportunity to have spent this day with my parishioners. I was with Matthew who is among the newest parishioners and I was with all of those buried in our cemetery who await the resurrection. When we prayed for Mathew today at Mass, we sang the Litany of the Saints. When we prayed at the cemetery, we sang the Litany of the Saints again. There's something beautiful to be said about this, but I'm totally wiped out and will have to save that for another day. I know that I'm a priest everyday, but today I really felt like a priest. I got up early, made my coffee, and prayed the Liturgy of the Hours. Since it is the Commemoration of All Souls today, as I prayed, I thought about the many people whom I've buried, given the Last Sacraments to, and all of the people in my parish who mourn their loss. Then, I offered the morning Mass. I was happy to see that there were more people than usual at Mass today. Among those who attended was Tyler, one of our Altar Boys. Tyler started serving daily Mass a couple of days a week. His Mom, a teacher at the parish school and Tyler's brother were also at Mass. If Tyler ever stops smiling, it will be a tragic day. After Mass, I heard a confession. After another cup of coffee(!) 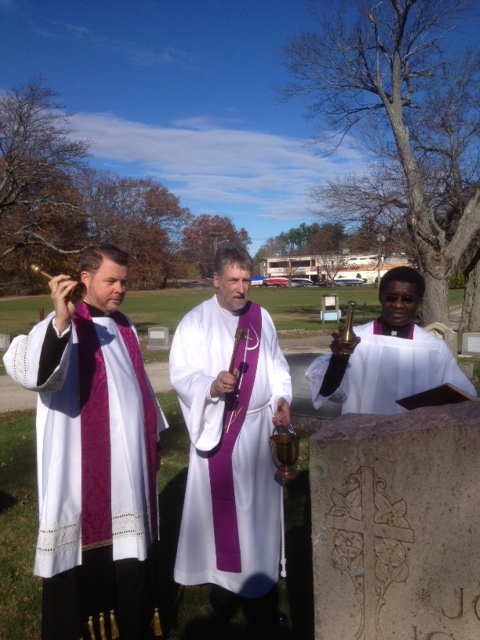 and some catching up with the staff, I offered a second Mass. (On the Feast of All Souls, priests are able to offer three Masses). The second Mass--since I was alone--I decided to offer in the Extraordinary Form. I don't get to offer the Extraordinary Form Mass very often--usually only once ever few months or so. So, I was forced to do things slowly. When I was in seminary, if somebody said that they liked the Extraordinary Form of the Mass, they would probably have been sent for a psychological evaluation! For me, it is a very beautiful form of the Mass. Having offered the Ordinary and Extraordinary Form, there are things I like about both. I'm not insistent upon either. I think probably the older Mass could have been renewed in a much more intelligent way, but, that's way above my pay grade. I'm not in any camp when it comes to the two forms. Or better put, I'm in the camp that appreciates them both and sees the need for renewal in both. Offering that Mass was great because in the Extraordinary Form, the priest is a little bit more at liberty to whisper the names of those whom he wishes to pray for during the commemoration of the dead. I had asked Facebook friends to send me any names that they wanted prayed for and I was able to honor their request and pray aloud for their loved ones. The rest of the day was spent doing some administrative chores with my staff (who are great), a nap (which was also great! ), and then getting ready for our evening Mass where we especially remembered those who died during the past year. I came into the church around 5:30 intending to get some preparation work done. Immediately in the sacristy appeared Brendan. Brendan is a fourth grader (maybe fifth?) who is an altar boy here. His mother was playing the harp for the Mass this evening so they had already arrived. Brendan is a big personality. He offered to light the candles. I told him that since Mass was still 1 1/2 hours away, perhaps we'd wait a little bit. (Altar boys are perpetually the same.) Brendan was a great help to me getting all sorts of things ready--and asked every ten minutes or so if it was time to light the candles and when we do light the candles which ones would we be lighting. Out of the blue, Brendan offered, "I really like coming here and serving Mass. I like to do all this stuff." I don't know why, but in that brief moment, as he sat in a chair on one side of the sacristy, swinging his legs back and forth, and I stood at the vesting case going through the Missal, I was struck by the great privilege of being a priest. Suddenly, I recalled being in the sacristy before Mass when I was an altar boy. Usually though, I found myself sitting up on top of the vesting case, swinging my legs. The pastor would remind me, "We aren't at the football field and that is not the bleachers." I'd slink down the vesting case as if sliding off instead of jumping off would somehow make it less an offense. But, I'd be back up there again soon. The other servers soon arrived and so did the lector, deacon, and other priest. The lector is a convert to Catholicism. The deacon was born and raised in Germany. The concelebrating priest was born and raised in Haiti. The altar boys are three young men who have taken their role seriously. It's been one of the great things about this parish. The servers know that they are doing something important and they strive to do it with excellence. If there were an altar server Olympics, they'd win the Gold. Right before Mass, one of the high school students who works at the parish and was supposed to be working tonight asked, "Is it okay if I come to Mass tonight?" Does he have any clue how happy that question would make a priest? After Mass, he said to me, "That Mass was incredible." At 7pm, the prelude over, we processed slowly down the aisle. The music tonight was entirely from Faure's Requiem. It was magnificent. I've always thought that Faure's Requiem is pretty close to what Heaven must sound like. When I hear it--especially at Mass--I think that it is like we are standing on the other side of heaven and--although we cannot hear it clearly and completely--we are catching the sounds of heaven. For instance, the In Paradisum. When I hear that, I feel like the door of heaven is opening and so the sound is travelling out as the soul of the deceased is being welcomed. And then, as the door closes behind the person, the sound of heaven returns to being hidden from us. My brother priest preached a beautiful homily that touched upon everything today's commemoration ought to teach us. Faith, hope, death, resurrection, mercy, eternal life, and living in preparation for judgment. In the congregation were persons whose Faith is likely great and those whose Faith is likely weak. There were people whose loved ones died by tragedy and by suicide. There were those whose loved ones died after long illnesses. There were those who lost young children, those who lost more than one family member, and those who lost parents. And, for the most part, I knew them all more than anyone else there. My heart overflowed with love for these people. I was so grateful to be able to offer this Mass for their loved ones, to help their deceased loved ones, and to provide some solace and consolation to the mourners. I started this blog with the simple hope that it might communicate something of what it is like to be a priest--and in my case, a pastor. Tonight, as I sat in the sanctuary and listened to the Pie Jesu, I felt like a pastor. The sorrowing were being consoled, the Dead received the aid of our prayers, those whose faith was weak were being built up, God was given fitting worship, a new deacon proclaimed the Gospel, a high school student came to Mass, three altar boys served God faithfully, a choir sang magnificently, a brother priest preached beautifully, and heaven and earth were united. I have some part to play in all of that. Each has his or her part to play. Those altar boys have good parents. The high school student has a good family and a good youth minister. The choir is filled with faith filled people and a great director. My part in all of it is to be the shepherd. God is very good to allow me to be the shepherd of his flock--the flock he loves so much that he suffered and died for them. When I think of being a pastor, I often think of what the psalm says: "He has put into my heart a marvelous love for the faithful ones who dwell in his land." Tonight, my heart echoes those words. He has indeed put into my heart a marvelous love for the faithful ones who dwell in his land.